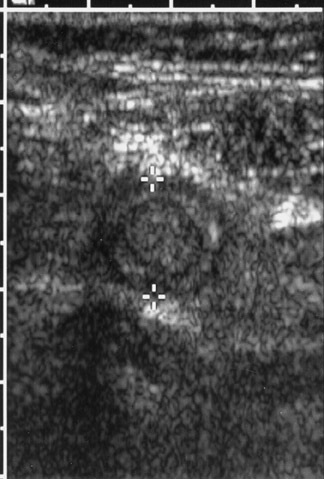 ﻿ What is the role of ultrasound in evaluating patients with right lower quadrant pain? What is the role of ultrasound in evaluating patients with right lower quadrant pain? Dr. McGahan is a Professor of Diagnostic Radiology and the Chief of Diagnostic Ultrasound at the University of California, Davis Medical Center, Sacramento, CA. Evaluation of acute right lower quadrant (RLQ) pain has undergone an evolution over the past decade. Previously, evaluation focused on history, physical examination, and laboratory results. 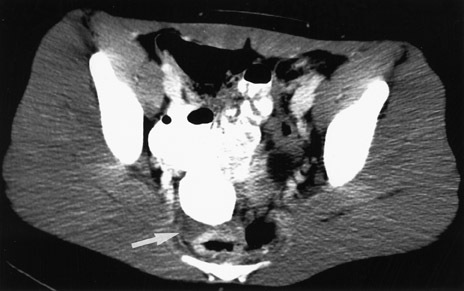 Plain radiographics were utilized in select patients, while the use of sonography was limited to patients with possible pelvic etiologies of pain. 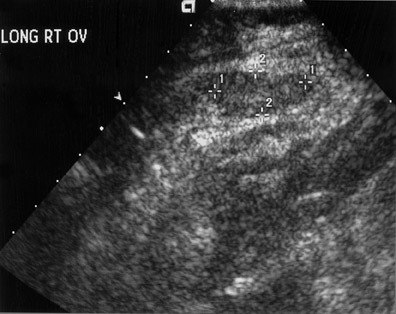 More recently, sonography and computerized tomography (CT) have played a larger role in evaluation of these patients. Much of the attention in evaluation of RLQ pain is to diagnose or exclude appendicitis. A list of diagnostic consideration for RLQ pain may be divided into the 3 "Gs"¡ªie, gastrointestinal, gynecological, and genitourinary (Table 1). 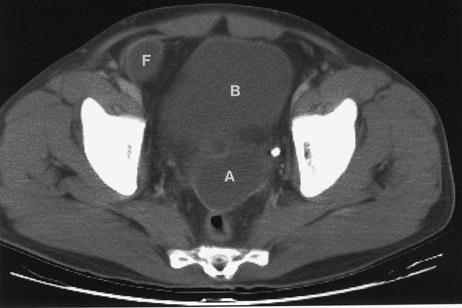 Much of the focus of this article will be on evaluation of patients with possible appendicitis. In addition to preventing unnecessary surgery, imaging can reduce intervention time, thus reducing potential complications, procrastination-induced expenses, and medical costs. 3 Finally, imaging is obviously important in establishing a correct diagnosis. For instance, in a series by Poortman, 4 41 of 199 patients (21%) with suspected acute appendicitis had an alternative diagnosis at surgery. 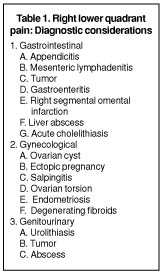 This was nearly equally divided into a gynecologic and a gastrointestinal etiology of symptoms (Table 2). Why not image with CT in all patients? The imaging literature generally reports an increase in sensitivity of CT compared with ultrasound in evaluation of patients with suspected acute appendicitis. For instance, in an early article by Balthazar, 5 he reported sensitivity of CT to be 90%, compared with the sensitivity of sonography of 76% in diagnosing acute appendicitis. Others have shown a general increased sensitivity of CT compared with ultrasound in diagnosing appendicitis. However, in a recent article by Poortman, 4 the sensitivities of CT and sonography were approximately equal at 76% and 79%, respectively. Noncontrast CT was reported to have been used in this study, while other studies would favor use of iodinated contrast-enhanced CT. 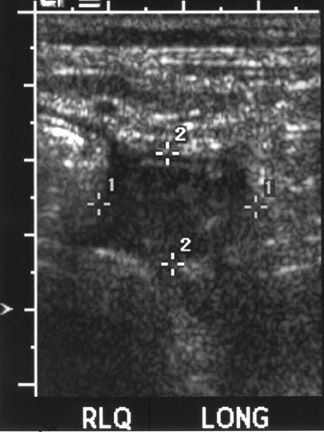 Furthermore, in select patient populations in which ultrasound is performed by individuals with experience in appendicular sonography, there are very high reported sensitivities of ultrasound for diagnosing appendicitis. Baldisserotto et al 6 reported sensitivity and specificity of compression and noncompression sonography to be 98.5% and 98.2%, respectively. This study was in a pediatric population aged 6 months to 12 years. Therefore, there are advantages of both sonography and CT; some of these are listed in Table 3. In reviewing Table 3, there is little doubt that, whenever possible, sonography should be used rather than CT. The disadvantages of CT include its expense and the high radiation dose. Radiation dose is especially problematic in the pediatric population. However, a major disadvantage of sonography is the limited ability of ultrasound to be used in the adult patient, especially those who are overweight or obese. This, unfortunately, includes a large segment of the U.S. population. Thus, this segment of the population is best examined by CT. Finally, operator dependence is a major factor in utilizing CT as opposed to ultrasound. While CT technique is automated and nearly "foolproof," the same cannot be said about sonography. 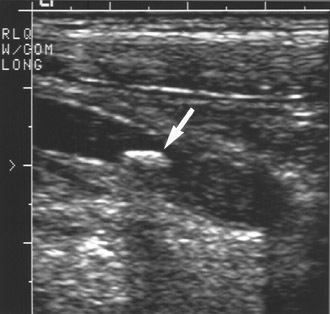 Precise technique must be used when performing ultrasound to evaluate the RLQ for possible appendicitis. "Practice makes perfect," and if the examiner performs an RLQ ultrasound only once a month, the advantage goes to CT. Therefore, sonography should ideally be used in the initial evaluation of the pediatric patient, in women of childbearing age, and for thin men. On occasion, both CT and ultrasound may be used (Figure 1). What is the best sonographic technique? 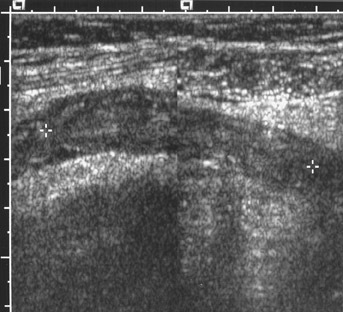 While there are many variations of techniques for evaluation of a patient with RLQ pain, I prefer initial use of a screening ultrasound followed by graded compression sonography. The initial screening examination is performed with a sector scanner (3 to 5 MHz) to get the "lay of the land." 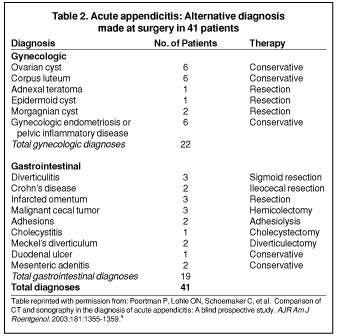 It is important not to focus only on the diagnosis of appendicitis, but to remember the 3 "Gs" (Table 1). A 4-MHz sector probe will be helpful to diagnosis genitourinary and etiologies, such as nephrolithiasis or renal obstruction (Figure 2). 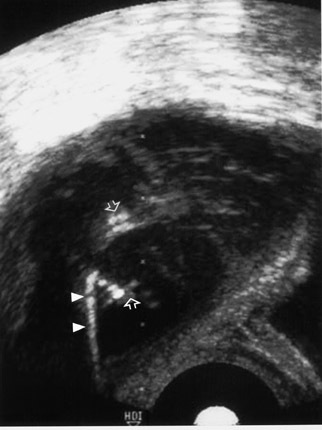 A sector probe can also diagnose some gynecological abnormalities, including possible ovarian pathology, such as a hemorrhagic cyst (Figure 3; Table 3). Thus, scanning should include a brief evaluation from the right upper quadrant to the pelvis. Patients with possible renal obstruction or cholecystitis may be diagnosed with a sector probe (Tables 1 and 2; Figure 2). 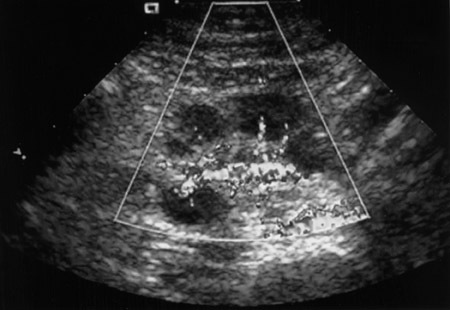 Also, gynecological abnormalities, such as ovarian cysts, may be visualized (Figure 3). Graded compression should include use of a linear array or curved linear array probe with a frequency from 6 to 9 MHz. I find that starting at the common femoral vessels and scanning cephalad is useful (Figures 4 and 5). It is important to have moderate probe pressure to compress the lumen of normal bowel. Also important is to observe peristalsis, which identifies a structure as a normal loop of bowel, rather than the appendix. A 3- to 4-MHz sector scanner is not appropriate for examining the appendix, since it does not allow significant resolution to identify the characteristic features of the bowel or appendix (Figure 6). It is also important when using a high-resolution linear array probe to concentrate on visualization of structures just deep to the abdominal musculature. The proper focal zone should be used, and the area of interest should be magnified to exhibit the region of interest. In thin or pediatric patients, the appendix is usually superficial and, therefore, the focal zone should be kept at no greater than 3 to 4 cm. Self-localization of pain by the patient is important. Ask the patient where his or her pain is located and concentrate on that region. 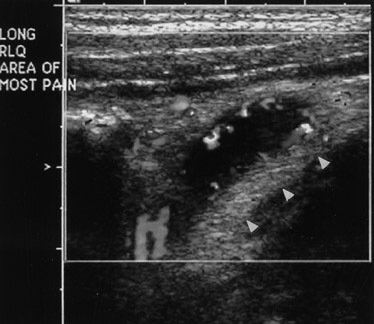 I find localization of the region of pain with the ultrasound probe is very important. 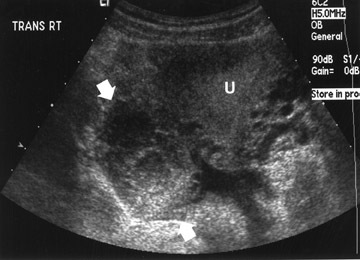 This is analogous to an ultrasound Murphy's sign in the gallbladder. Pain should direct the examination to the area of tenderness, where the abnormality may be located. 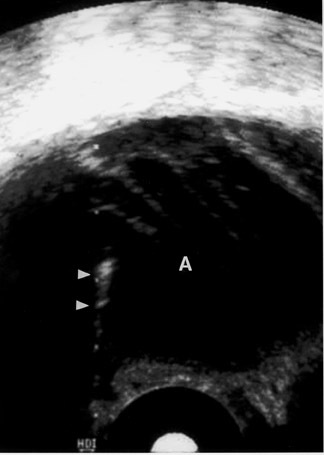 Finally, in women, if a diagnosis is not made by the general survey examination or the compression technique, endovaginal sonography may be use-ful. 7 This may be helpful to diagnose an infiamed appendix located in the pelvis or gynecological etiologies of pain (Figure 7). 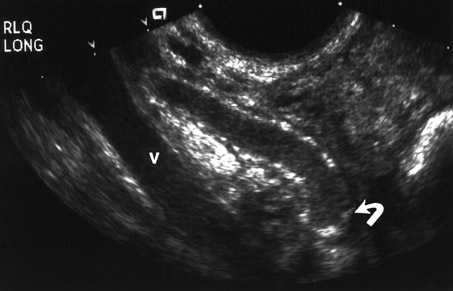 Because gynecological abnormalities are often a cause of RLQ pain, endovaginal sonography should always be performed whenever possible. What are sonographic findings of acute appendicitis? 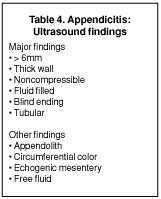 Helpful sonographic findings in diagnosing acute appendicitis include a blind-ending, noncompressible, fiuid-filled tubular structure with a diameter >6 mm (Table 4; Figure 8). In addition, whenever even small amounts of free fiuid are noted in the RLQ, this should raise the suspicion of a possible pathologic process, including appendicitis. 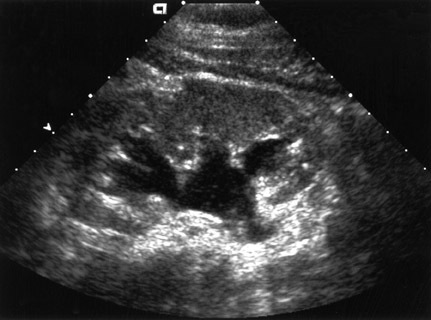 Free fiuid and increased mesenteric echogenicity may occur later in the course of appendicitis. The increased echogenicity of the mesentery can be easily overlooked. This is similar to the mesenteric stranding identified on CT. 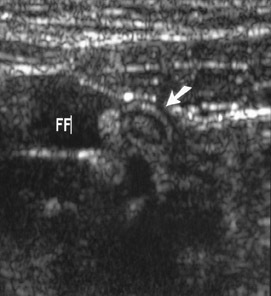 Finally, increased color fiow may be seen in the wall of the appendix (Figure 9). However, this finding is lost with gangrenous appendicitis. If the diagnosis of appendicitis is overlooked, acute appendicitis may progress to gangrenous appendicitis. 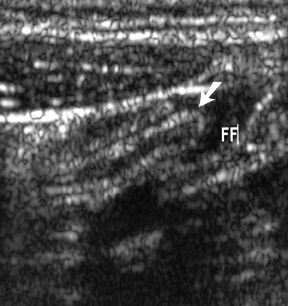 Sonographic features of gangrenous appendicitis include increasing echogenicity of the mesentery, free fiuid in the RLQ, and eventual loss of appendicular color fiow. Eventually, the appendix may rupture. The infiammation may be walled off in the RLQ as a focal abscess. In other situations, fiuid may spread through the abdomen, but it most commonly spreads into the pelvis. 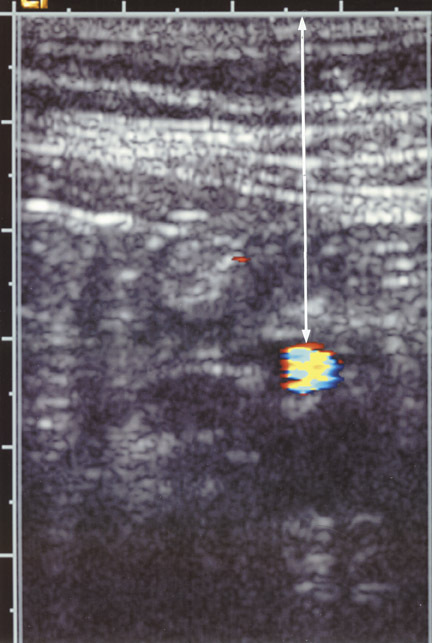 Sonographically, an appendicitis abscess appears as a thick-walled, fiuid-filled structure. There may be a "dirty" shadow if air is present in the abscess. What are the alternative diagnoses to consider? Differential diagnoses for RLQ pain are listed in Table 1. While review of all these diagnoses is beyond the scope of this article, at least one diagnosis must be mentioned briefiy. Mesenteric adenitis is a diagnosis that is easily confused with appendicitis in children. Mesenteric adenitis may be secondary to a diffuse gastrointestinal infiammatory process and, perhaps, should be more correctly called mesenteric adenitis-enteritis. 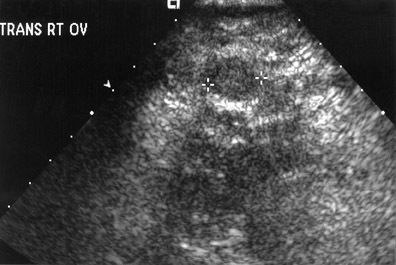 The sonographic hallmark of this entity is enlarged mesenteric nodes (approximately 1 cm), which are both tender and hypervascular (Figure 12). Remember that these infiamed mesenteric nodes refiect gastrointestinal infiammation. Usually, the appendix is not involved with mesenteric adenitis, which is most commonly a self-limiting process. Mesenteric adenitis may be associated with hypervascularity of the surrounding mesentery or infiammation and thickening of the terminal ileum. This diagnosis should be kept in mind when examining the pediatric patient with RLQ pain. Other diagnoses must also be considered in patients with RLQ pain. Some gastrointestinal etiologies may not be diagnosed by sonography (Table 2). However, most gynecological etiologies of RLQ pain may be identified sonographically. This can include anything from a ruptured or hemorrhagic ovarian cyst (Figure 3) to an ovarian abscess from pelvic infiammatory disease. 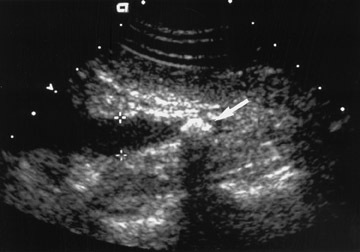 Therefore, in female patients, an endovaginal scan should almost always be obtained. 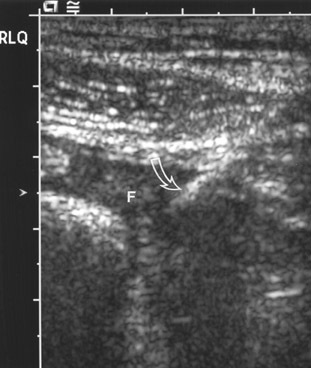 Sonography can be used in the initial evaluation of right lower quadrant pain in pediatric patients, women of childbearing age, and for thin males. 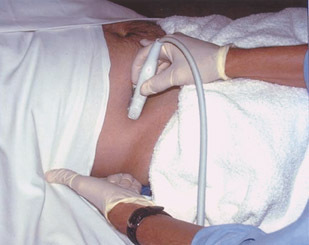 Precise technique and concentration on graded compression sonography using a linear or curved linear probe is necessary to properly identify the infiamed appendix. However, other etiologies of right lower quadrant pain should be considered and are easily diagnosed with sonography. 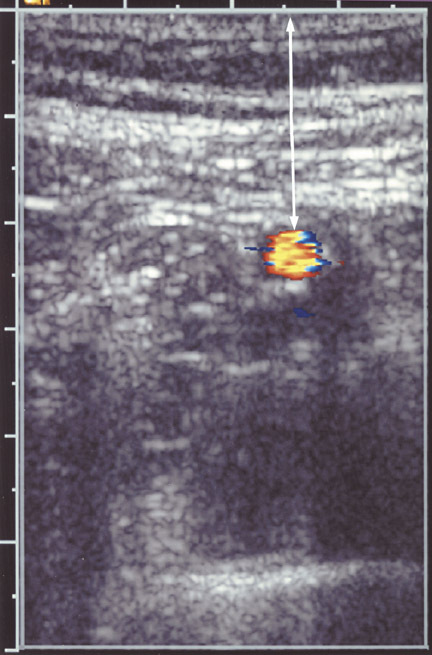 What is the role of ultrasound in evaluating patients with right lower quadrant pain?. Appl Radiol.